Americans are eating out more than ever, but going out to eat doesn’t have to be a diet disaster. 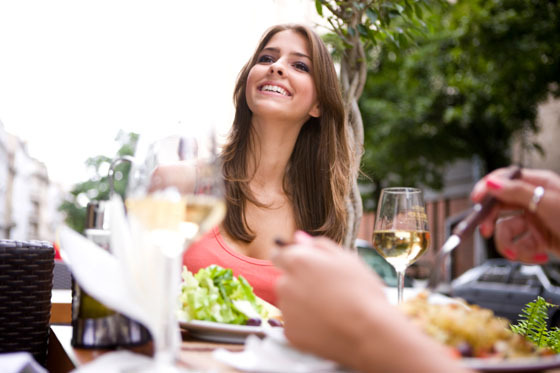 You can still lose weight with healthy eating when dining out. While restaurants used to mean special occasions, now almost half of adults eat at restaurants, or order takeout every day for convenience, variety, or taste. But if dieting while eating out means choosing one from column A and one from column B, then you can face disaster for your weight loss goals. Staying home and steaming veggies is not the only option! Whether you love Italian, or Japanese, or Mexican, or all of the above, there are plenty of healthy restaurant options that work with your desire to lose weight. When everyone is ordering mouth-watering—and fattening—appetizers, the worst thing to do is order nothing. Always start your meal with a salad (dressing on the side) or a cup of soup (broth-based)—2 nutritious, low-calorie options that keep you from attacking the bread basket and help you feel a bit fuller before your entrée arrives. Tips for Eating Italian Food—Pasta on a Diet Is Not the Enemy! The low-carb diet craze has made pasta the bad boy your mamma warned you not to date. We were told that to lose weight, we had to bid our beloved carbs—bread, pasta, and rice—goodbye. So, how is it that in Italy, people eat pasta daily without the same obesity rates we have in the U.S.? The secret: Italians serve pasta as a first course, or primo piatto, rather than as an entrée, as we do in America. The problem with pasta on a diet? Spaghetti as a main dish can weigh in at a whopping 1,000 calories, more than half of your daily calorie allowance! Don’t skip the pasta, just have it as an appetizer, about 300 calories. Then, order grilled fish or meat with a side of vegetables for your main course, and you’ll get a well-balanced and satisfying meal. Chinese food in the U.S. caters to the American taste for fried food and meat-based entrées, rather than the healthy grain- and vegetable-based dishes traditionally found in China. While on a diet, steer clear of fried favorites like egg rolls, orange beef, and kung pao chicken, which packs an eye-popping 1,275 calories—the same amount of fat as 4 McDonald’s Quarter-Pounders! A better option while eating out: choose low-fat dishes that are stir-fried or steamed, and loaded with vegetables and lean protein. If steamed dishes seem bland, order a stir-fried dish and a steamed dish and mix them together—the stir-fry adds flavor to the steamed option, while the steamed reduces the calorie and fat content of the stir-fry. Sushi bars and restaurants are popping up more than any other type of ethnic food. Sounds like good news for your weight-loss plan, since Japanese cuisine is inherently healthy. Leave it to the American fried-food fixation to spoil the fun. Sushi rolls such as spider (fried soft-shell crab), tempura (deep-fried shrimp or vegetables), and Philadelphia (smoked salmon and cream cheese) are high in fat and can wreak havoc on your waistline. Instead, go for the miso soup (50 calories), a house salad with ginger dressing on the side (110 calories), and sushi or sashimi, both great sources of healthy omega-3 fatty acids. Opt for lean fish and shellfish like tuna, shrimp, and scallops, and avoid fattier fish like yellowtail, salmon, and eel. If you aren’t ready for to go raw, chicken, salmon, and beef teriyaki are all good bets when eating out while on a diet. Can’t resist the tortilla chips at your favorite Mexican restaurant? They may be free, but they can cost you a lot in calories—15 chips equal 200 calories. And every dip into that bowl of guacamole adds 35 more calories. That’s 675 calories for 15 chips, before you’ve even ordered dinner! For a guilt-free starter, switch out the chips and guac for a tortilla (100 calories) with salsa (10 calories for 2 tablespoons). Then, have an appetizer like black bean soup, which is flavorful and filling, with 8 grams of fiber. Avoid main-dish diet pitfalls like nachos grande (beef, guacamole, cheese, and sour cream), which can set you back 1,400 calories. Even a seemingly small quesadilla can contain 500 calories. Your best bet for diet-friendly entrées when eating out at a Mexican restaurant ? Go for grilled vegetables and lean protein, such as chicken or shrimp fajitas. But don’t add the fattening condiments—go for peppers and onions to bulk up your tortilla, not your body. Greek food is one of the world’s healthiest cuisines. Full of heart-healthy monounsaturated fats (olive oil and nuts), fish, and vegetables, it’s hard to go wrong when dining Greek. But there are a few dishes that are diet disasters. Pastitsio and mousakka are both filled with rich cream sauce. Cream sauce in any language translates as calories and fat. And while phyllo dough, which is common in Greek cuisine, might seem flaky and light, each layer is actually brushed with butter to make it crisp. Another traditional Greek food, feta cheese, is mistakenly thought of as a diet-friendly cheese. In fact, 1 ounce has 75 calories and 6g of fat. Make sure not to eat more than 2 ounces. A waist-friendly way to dine Greek—start with Greek salad (dressing on the side), then have a grilled-calamari appetizer, followed by a Greek-cuisine classic, grilled fish.